Did you know that April is World Autism Month? During April, Great Wolf Lodge is teaming up with Autism Speaks and pledging to “go blue” in support of a more inclusive world for people with autism and their families through a month-long Blue Wolf Ears fundraising campaign. Autism, or autism spectrum disorder, refers to a broad range of conditions characterized by challenges with social skills, repetitive behaviors, speech and nonverbal communication. We now know that there is not one autism but many subtypes, and each person with autism can have unique strengths and challenges. Most are caused by a combination of genetic and environmental influences. One in 59 children are on the autism spectrum. Throughout April, the family-friendly indoor water park resort will offer a blue version of the brand’s signature wolf ears, available to guests for a minimum $5 donation to Autism Speaks. A limited-edition collection of 10,000 blue wolf ears were made for this event and will be available for purchase at all 16 of the company’s U.S.-based resorts. All proceeds from the Blue Wolf Ears campaign go directly to Autism Speaks, with a goal of raising $50,000 to support its mission of enhancing lives across the spectrum at every stage of life. Last year alone, the non-profit aided more than 1 million people through Autism Speaks-funded programs and resources. To increase understanding and acceptance of people with autism, Great Wolf Lodge is launching a social media campaign in conjunction with the Blue Wolf Ears effort. 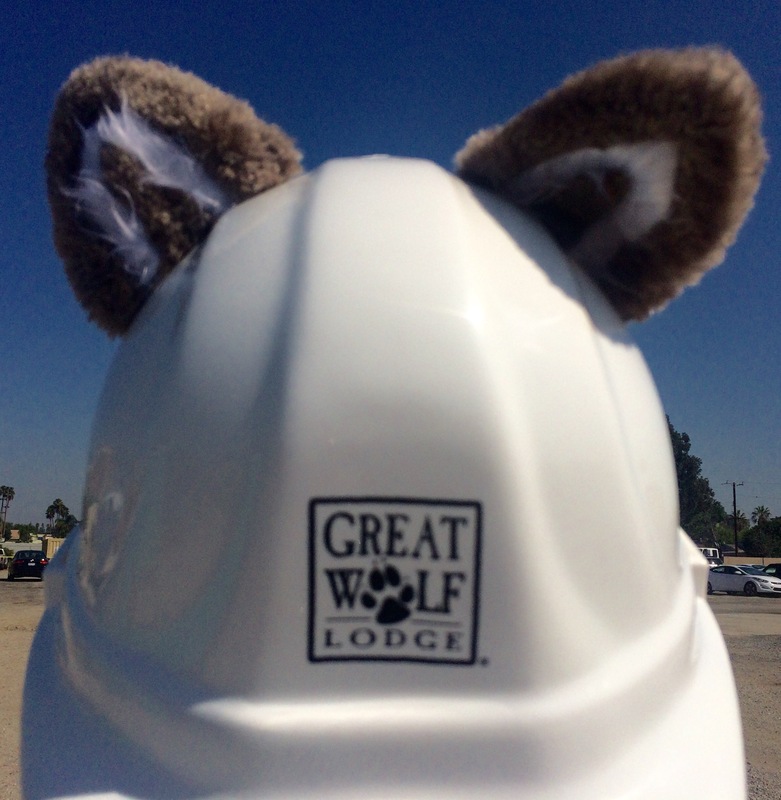 The company encourages guests to post a photo on social media of themselves or a family member wearing their blue wolf ears, using #GreatWolfCares. For each post using this special hashtag, Great Wolf Lodge will make an additional $5 donation to Autism Speaks, up to $20,000. “We’re honored to have this opportunity to give back during World Autism Month and to help raise funds for a terrific organization like Autism Speaks. Our Blue Wolf Ears campaign is just the start of a long-term partnership with Autism Speaks. In the future, we hope to use their expertise to help guide us as we continue to explore ways to make our resorts even more welcoming for people with autism and their families.” – Erin Wallace, chief operating officer of Great Wolf Resorts. For more information on Great Wolf Resorts and its brands of indoor water park resorts, please visit greatwolf.com. Some images and logos are property of Great Wolf Lodge and Autism Speaks and used with permission. As summer is coming to an end, we are getting excited for the arrival of fall and the start of the holiday season! First up, HALLOWEEN! Are you ready? We are! And so is Great Wolf Lodge! They’ll kick off kick their annual Howl-O-Ween festivities with seasonal celebrations all month long for guests staying at the resort. There’s nothing like 105,000 square feet of water park fun and Halloween-centric activities for the whole family. Throughout October, families can find special complimentary guest programming from a Howl-O-Ween House in the lobby to nightly Howl-O-Ween themed dance parties, Haunted Hustle scavenger hunts, boo bingo and more. How fun is that? Nightly Howl-O-Ween themed games in the lobby including Witch Hat Ring Toss, Mummy Bowling, Feed the Monster, Boo Bingo, Candy Corn Guessing Game + more. This all sounds like a lot of fun! Great Wolf Lodge’s Howl-O-Ween For more information and to book your family’s Howl-o-ween stay, please visit here. Some images and video are property of Great Wolf Lodge and used with permission. Spring is in the air at Great Wolf Lodge as their annual Spring-a-Palooza celebration returns March 9- April 15. Spring-a-Palooza is the perfect way for families to celebrate the changing of the season. Guests staying at Great Wolf Lodge Southern California can enjoy special offerings such as spring picnics and bubble dance parties, character-inspired flower gardens and more in the Grand Lobby. A highlight this year, for the first time Great Wolf Lodge is partnering with Alex’s Lemonade Stand Foundation at all 14 U.S. Great Wolf Lodge locations to generate funds and raise awareness to help end childhood cancer. “We’re honored to partner with such an important organization as Alex’s Lemonade Stand Foundation during our Spring-a-Palooza celebration. Our goal each and every day is to bring joy to families and what could be more joyful than for us to stand together as a pack to raise funds to end childhood cancer.” – says Erin Wallace, Chief Operating Officer of Great Wolf Resorts. Spring Cinema: Families can unwind after a fun-filled day and enjoy a family movie in the Grand Lobby. Spring Picnic: A time-honored spring tradition gets a Great Wolf twist, as guests can grab a blanket, spread it out on the floor and enjoy an afternoon picnic in the Grand Lobby. Guests can sip complimentary Minute Maid beverage available from the Great Wolf Lodge character-themed Lemonade Stand and play a few rounds of “Take A Wiley Guess” card game. Bubble Dance Party: This special Spring-a-Palooza event fills the Grand Lobby with cascading bubbles while Great Wolf Lodge’s Ambassadors of Fun keep energy-levels high with a family-friendly dance party. Spring-a-Palooza Story Time: Great Wolf Lodge’s nightly Story Time takes on a spring themed tale featuring the Great Wolf Lodge characters called “Natural Wonders.” Kids are encouraged to wear their favorite jammies to the Grand Lobby for this event and will have the opportunity to meet one of the Great Wolf Lodge characters in person. Spring Scavenger Hunts: Great Wolf Lodge features two self-guided scavenger hunts as part of Spring-a-Palooza. The “I Spy Spring” scavenger hunt will have guests looking high and low in the Grand Lobby to find a dozen hidden objects. The “Spring Sprint” scavenger hunt has guests solving clues that will take them on a journey throughout the lodge. When all 10 clues are solved, guests are rewarded with a prize. Character Themed Flower Gardens: A highlight of the Spring-a-Palooza celebration is the colorful springtime gardens found in the Grand Lobby. The gardens are designed and handcrafted by Pack Members from the resort. The collection of flower pots are inspired by the Great Wolf Lodgecharacters. Guests are encourage to stroll around the garden and vote for their favorite display. Jelly Bean Guessing Game: A gigantic jar filled to the brim with jelly bean candies sits in the Grand Lobby and guests are invited to enter a contest guessing how many delicious treats are within the jar. The guests closest to the correct number without going over will be entered for a chance to win a Great Wolf Lodge Gift Card. Spring Themed Crafts: During Spring-a-Palooza, the resort’s Ambassadors of Fun will host several spring-inspired craft making events for kids of all ages. Character-themed crafting projects include Oliver’s Crazy About Bugs Jar, Violet’s Springtime Noodle Doodle, Brinley’s Don’t Blow Away Kite and Wiley’s Can You Spot It Binoculars. In addition to two days of play in the water park for each night stayed at Great Wolf Lodge, all of the Spring-a-Palooza activities are included as part of an overnight stay for no extra charge. Activities vary daily and based on location. A complete listing of daily activities and times can be found in the Lodge Life event schedule provided to guests upon check-in, verified in advance at GreatWolf.com or by calling Great Wolf Lodge directly at 888.960.9653. For more information on Great Wolf Resorts and its brands of indoor water park resorts, visit greatwolf.com. Some images are property of Great Wolf Lodge and used with permission. Make this holiday season a memorable one with Great Wolf Lodge Southern California as they celebrate their favorite winter howl-i-day…Snowland! Create new family traditions this holiday season with uninterrupted time together under the enchanting spell of Snowland’s twinkling lights, holiday trees and indoor snow showers that melt into perfect 84-degree basking weather in the Great Wolf Lodge water park. The entire resort is transformed into a magical winter wonderland. Starting November 26 and running through January 1, Great Wolf Lodge will have a limited number of Snowland Suites available, so book yours here today! Snowland-themed suites – Great Wolf Lodge transforms 10 of its suites during “Snowland” into an enchanting Snowland Suites, just for the holidays. Each one comes complete with glimmering garlands, twinkling lights and a fully decorated holiday tree. You’ll open the door to your personal winter wonderland and receive a free copy of the winter story book, “Unique as a Snowflake”. Great Wolf will also surprise your children with an evening milk and cookies delivery by one of our Great Wolf Kids characters! During your stay, your children can enroll in North Pole University for their winter, 2016-2017 snow-mester. They’ll delight in completing our holiday-themed activities and receiving their official “Snowploma”. They also receive a limited edition Rowdy the Reindeer trading card you can only get here! The Great Wolf Lodge culinary team spend weeks cooking up and creating the intricate beauty of their life-size gingerbread houses. Each unique-as-a-snowflake masterwork welcomes you with amazingly detailed gingerbread walls, candy trim and plenty of white icing snow. When you dine in, your fee goes to the Ronald McDonald House Charities®! 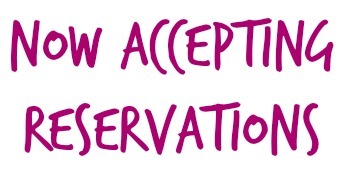 You can request to dine in one when you book your dining reservation. As you can see, there’s a lot going on over at Great Wolf Lodge during Snowland. It’s the chance to create some new holiday memories with your family and you won’t want to miss out! Connect with Great Wolf Lodge Southern California on Facebook, Twitter, & Instagram. This is not a sponsored post. 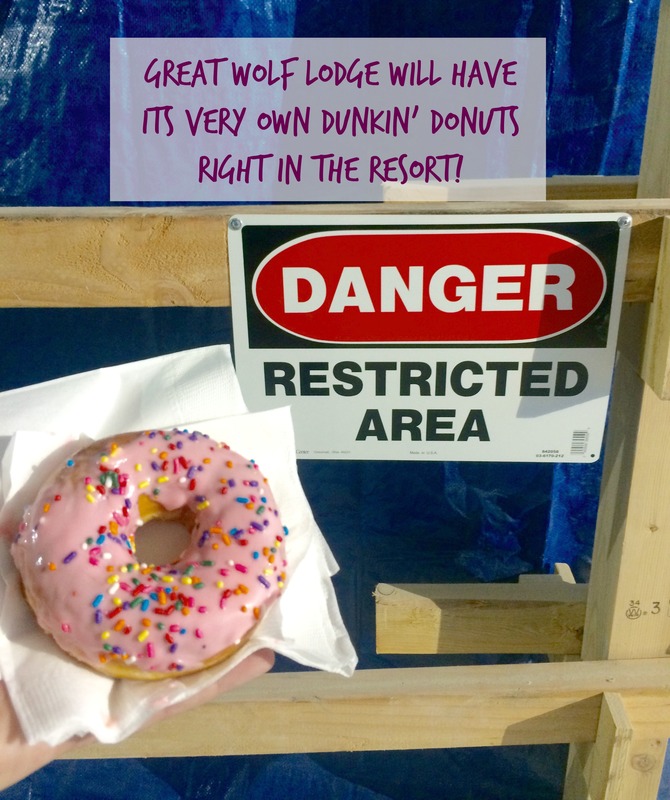 Images and logos are property of Great Wolf Lodge. All opinions are 100% my own. 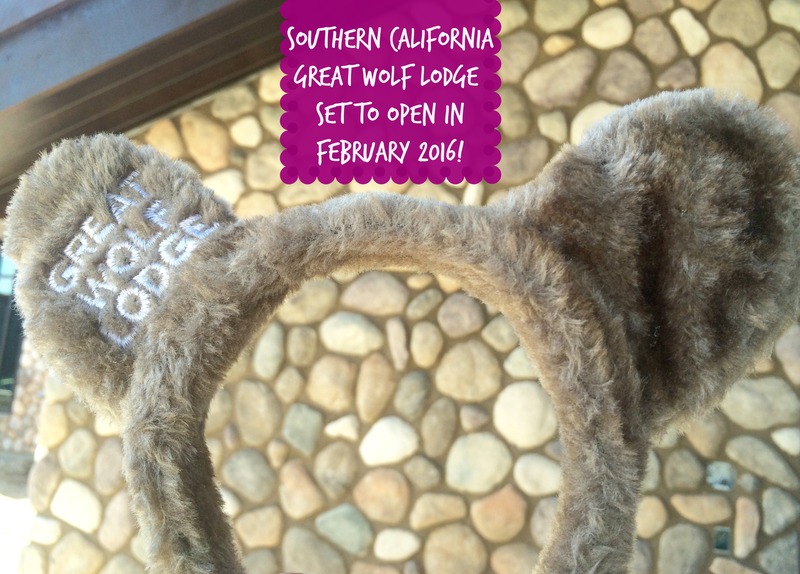 Great Wolf Lodge® is opening in Southern California and our family is ecstatic! I was invited to take a hard hat tour of the newest location, which is currently under construction in Garden Grove and I’ve never seen anything like it! Great Wolf Lodge refers to themselves as the ultimate family vacation destination and I can see why! They pride themselves on providing quality accommodations, exceptional services, and a variety of amenities and entertainment all under one roof. The 603-room all-suite resort is going to WOW when they walk in! 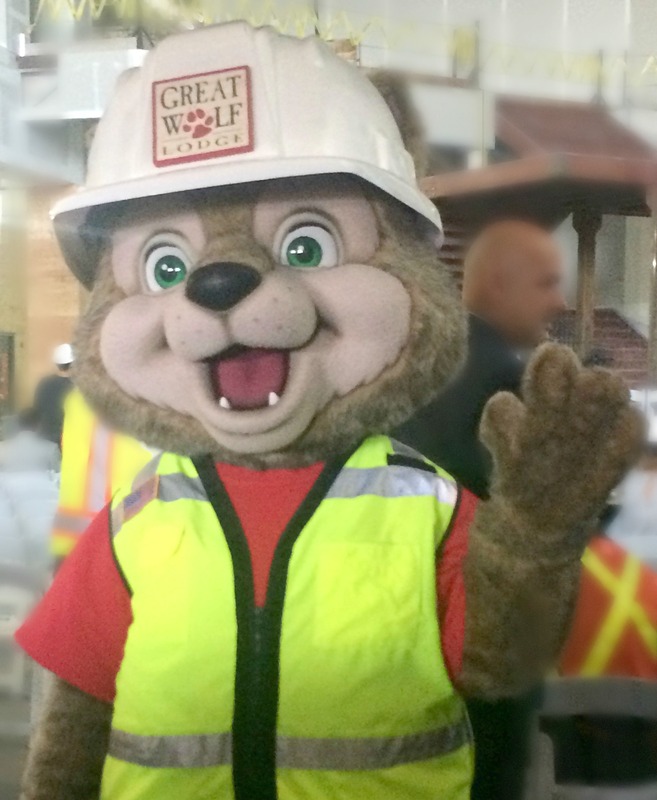 At the start of the facility tour, I got to meet Wiley the Wolf, who is the official Great Wolf Lodge mascot. As I was During my hard hat tour, I felt like my mouth kept dropped open around every new corner! Seriously, I cannot wait for it to open! 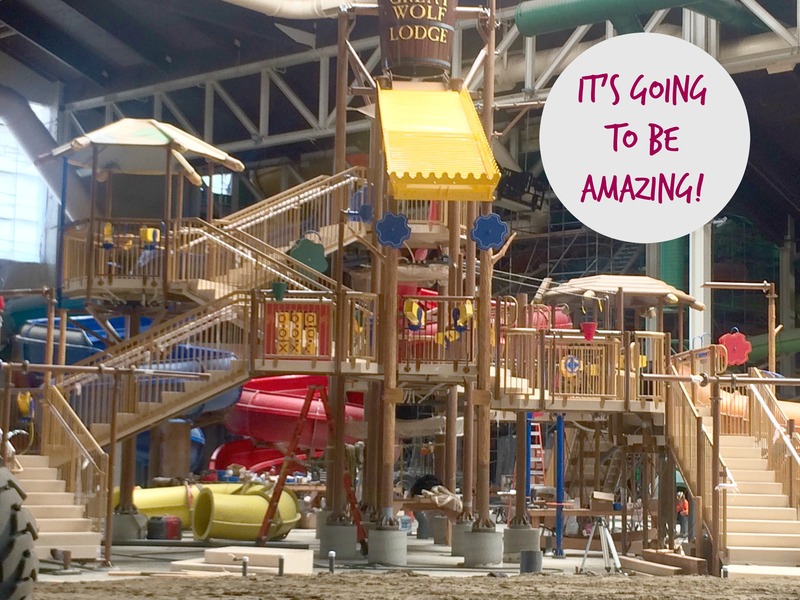 The GIANT 105,000 square-foot indoor water park at Great Wolf Lodge is the most popular amenity for resort guests. Water park passes are already included in the cost of your stay and are exclusive for the guests staying at Great Wolf Lodge. The water park itself is maintained at 84 degrees which means that weather will never affect your stay. Unique water slides and attractions will offer something for everyone. 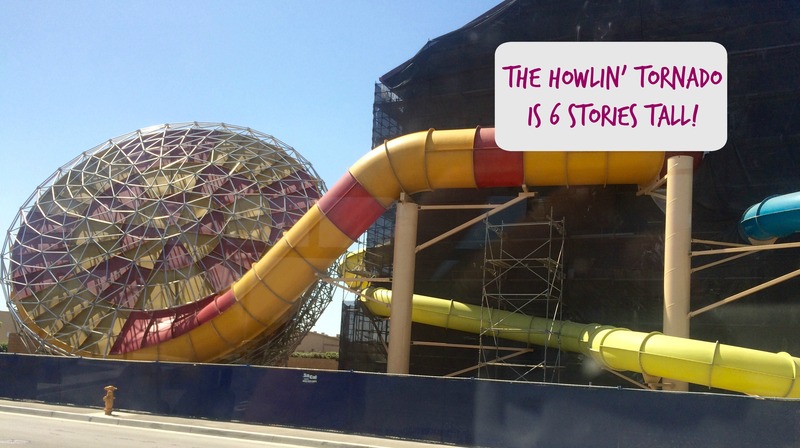 The Howlin’ Tornado is the water park’s signature ride and is six stories tall! It sends riders swooshing up and down its enormous funnel before the final splash into the catch pool! I can’t wait to get on it! Let’s talk about the accommodations! There are more than a handful of different suite options to choose from at Great Wolf. Each suite offers a complimentary coffee pot, microwave, and refrigerator. 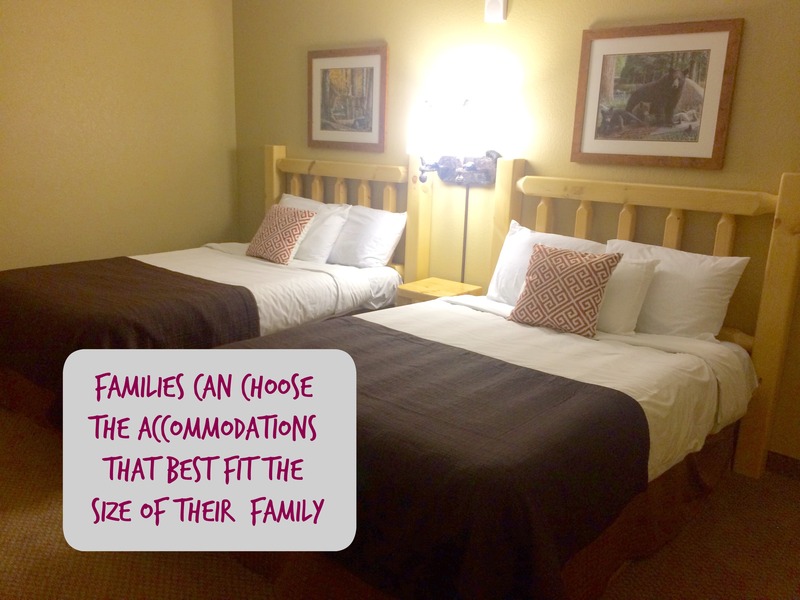 Families have plenty of room to spread out and relax and can choose the accommodations that best fit the size of their family. Double Queen Suite – Features two queen beds and sleeps up to 4 guests. Family Suite – Features two queen beds and a full sofa sleeper and sleeps up to 6 guests. Wolf Den Suite – Features a queen bed, full sofa sleeper and a themed Wolf Den, complete with a set of bunk beds. Sleeps up to 6 guests. KidCabin Suite – Features a queen bed, full sofa sleeper and a Great Wolf Kids-themed KidCabin complete with bunk beds and a twin bed. Sleeps up to 7 guests. Grand Bear Suite – Features a private master bedroom with a king bed and a full bathroom. The main area includes two queen beds, a full sleeper sofa and a second bathroom. Sleeps up to 8 guests. Great Bear Suite – Features two queen beds and a semi-private living room, complete with a private master bedroom with queen bed. Sleeps up to 6 guests. Great Bear King – Features two queen beds and a semi-private living room, complete with a private master bedroom with king bed. Sleeps up to 6 guests. The dining options at Great Wolf provide something for everyone in the family to enjoy. I like that Great Wolf not only acknowledges kids can be picky eaters but also offers options for guests with food allergies and have special dietary needs ,such as a gluten free diet. It’s something that moms can really appreciate as it isn’t often easy to dine out when your child has those kinds of needs. Lodge Wood Fired Grill – A full serve a la carte restaurant open for lunch and dinner, with delectable shareables and unique signature items to create the perfect place to eat. Hungry as a Wolf – Family meals on the go for lunch and dinner featuring fresh made pizza, sandwiches, salads, and pasta. 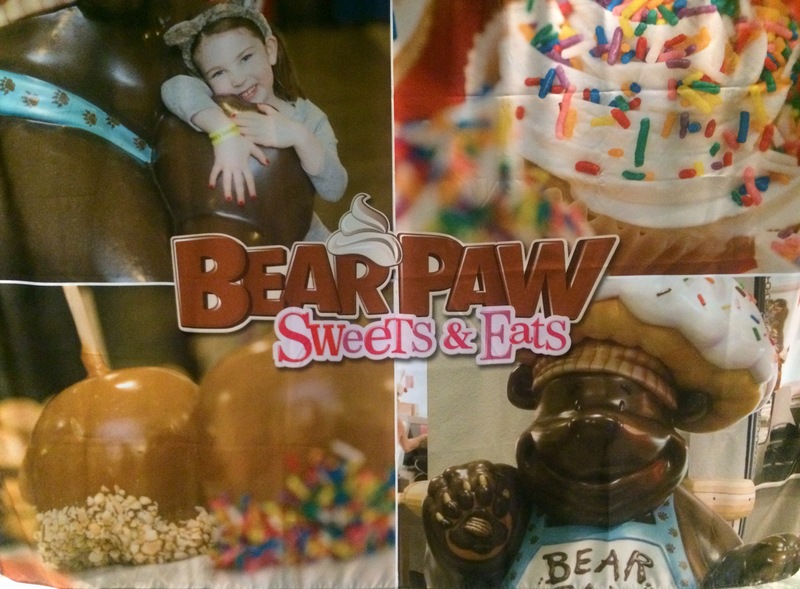 Bear Paw Sweets & Eats – A confectionary that offers a variety of treats, such as fresh-baked pastries, ice cream, lodge-made fudge and more. Buckets Incredible Craveables – Located inside the water park, the casual menu offers burgers, hot dogs, french fries, cold beverages, ice cream, and more. Loose Moose Family Kitchen – A buffet style restaurant, open for breakfast and dinner, that has options for the entire family. Grizzly Jack’s Bar and Grill – Located by the outdoor water park, this is the place to refuel for more fun in the sun, offering a variety of food and drinks to choose from. Dunkin’ Donuts – Located right inside the resort, this is America’s favorite all-day stop for coffee and baked goods. Character Appearances – Daily appearances with Wiley the Wolf and Violet the Wolf. Story Time – The entire family can gather in the Grand Lobby each evening to hear a story about the Great Wolf Kids characters before bedtime. Wolf Walk – Learn about the many animals and wildlife living in the Northwoods and make an origami wolf to take home. MagiQuest – Battle dragons, befriend a pixie and wave a magic wand in this live-action adventure game throughout the resort. The games feature three unique chapters, each with their own challenges and quests. The Great Wolf Kids Program – Daily activities for kids that take place around the resort, including dance parties, face painting, and games such as Wiley Bingo, Character Floor Memory, and Character Trivia. Howly Wood XD Theater – This motion thrill ride transports riders directly into the movie action with every effect amplified, creating an unforgettable experience. Howl at the Moon Mini Golf – 9-hole themed indoor miniature golf course. 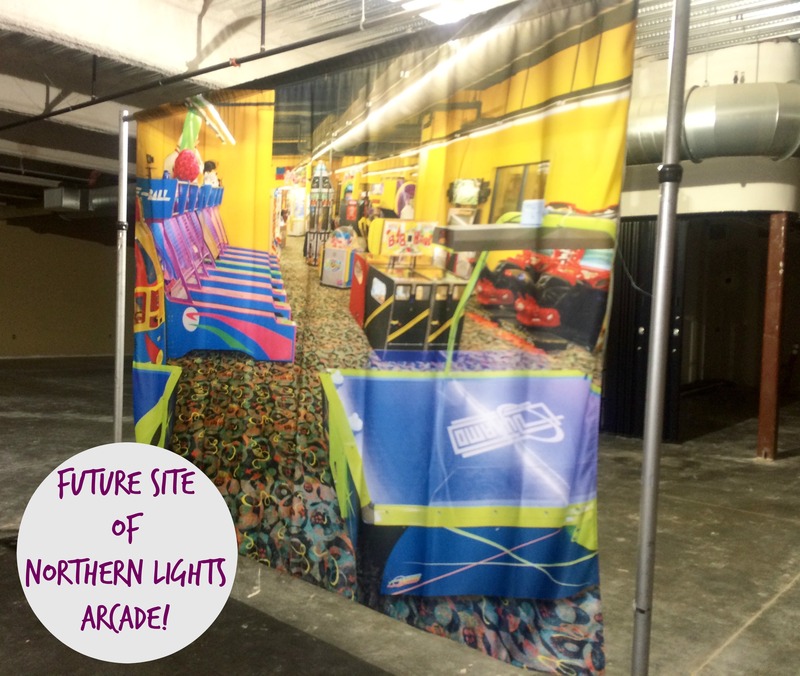 Northern Lights Arcade – More than 100 interactive video and redemption games that allow guests to redeem points for prizes. 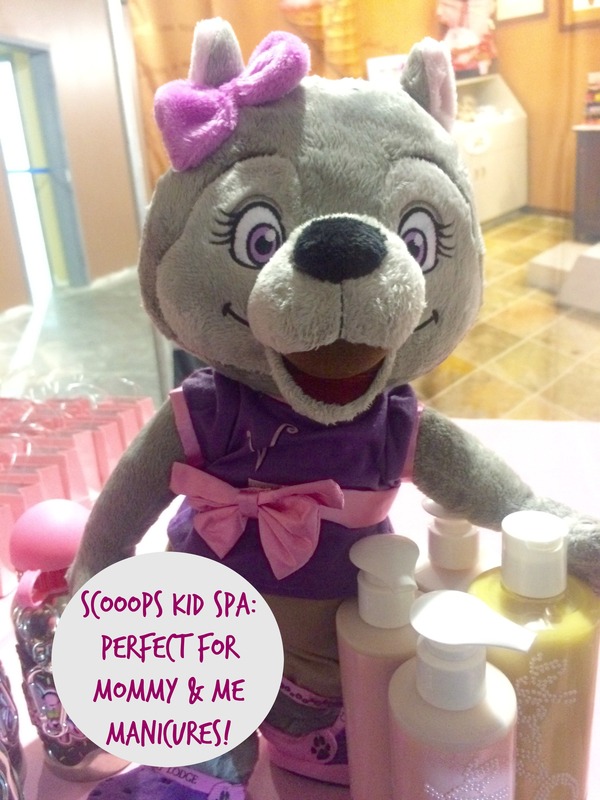 Scooops Kid Spa – A unique spa created for kids, complete with ice cream-themed manicures, pedicures, and more. Each service includes a real ice cream treat. Ten Paw Alley – Family-style bowling with pint-sized bowling balls. Clubhouse Crew – Interactive Scavenger hunt through the resort starring the Great Wolf Kids characters. 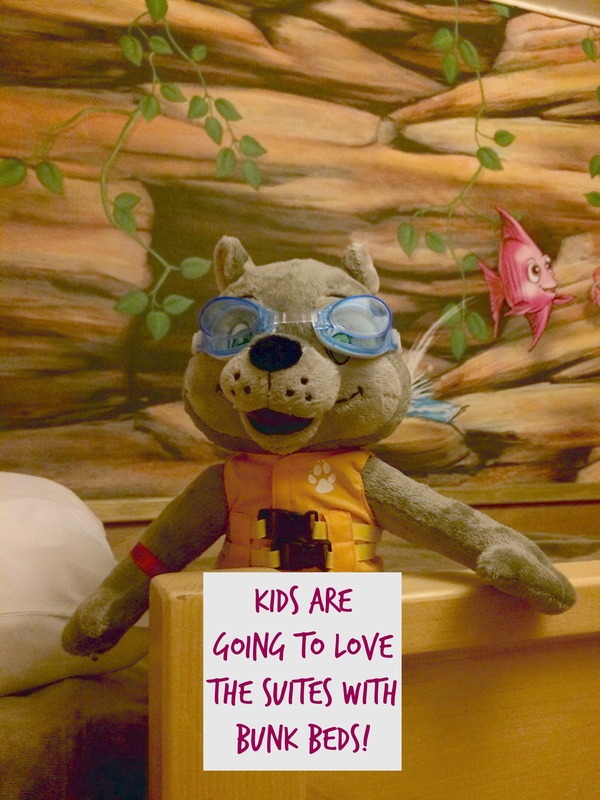 It’s the perfect experience for the resort’s youngest guests. Laser Frenzy – An exciting arcade-style game with the latest in touch and LED technology. Players can see who is fastest as they dart between the “laser beams”. The Great Wolf Lodge Southern California also features over 20,000 sq. feet of meeting and banquet space. It’s the ideal location to host corporate meetings, youth excursions, family reunions, special occasions or more. With 12 separate and configurable meeting rooms, the resort’s team of experienced meeting professionals can create the perfect space to your needs. 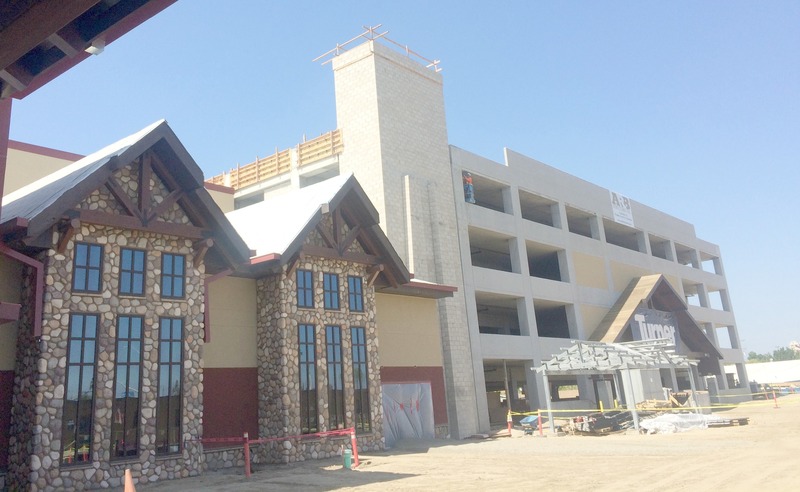 Great Wolf Lodge Southern California is now accepting reservations for its newest location. You can book reservations for March 2016 through December 2016 by visiting http://www.greatwolf.com or calling 1-888-960-WOLF (9653). Connect with Great Wolf Lodge Southern California on Facebook, Twitter, and Instagram.